My regular readers will already know that I run an equal opportunity household when it comes to play. Just because you’re little, doesn’t mean you are no entitled to exploration opportunities. I don’t believe “being a baby” is a spectator sport. But I do understand that there are certain limitations that come with infancy, and that is one of safety. There simply are SOME things that babies can’t play at. But art should never be one of them. 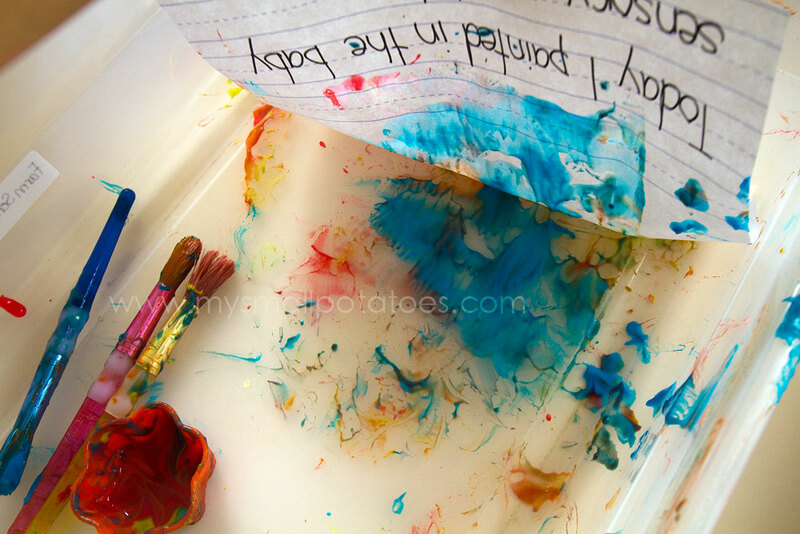 I get it…art with babies is a messy undertaking. They spread their “masterpiece” everywhere. They put the materials in their mouths, they shake and smash things, and they spill. 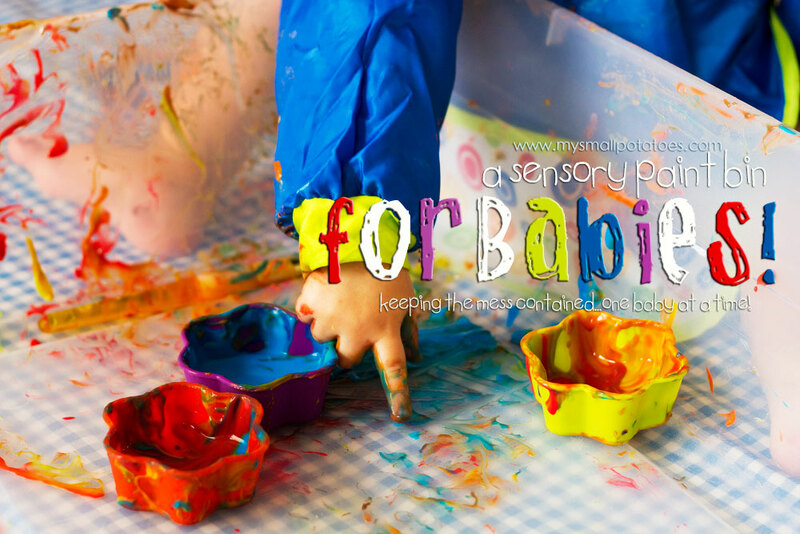 Here is an activity that helps contain all that a baby will do, but still allows them the freedom to explore the art of painting with a brush. 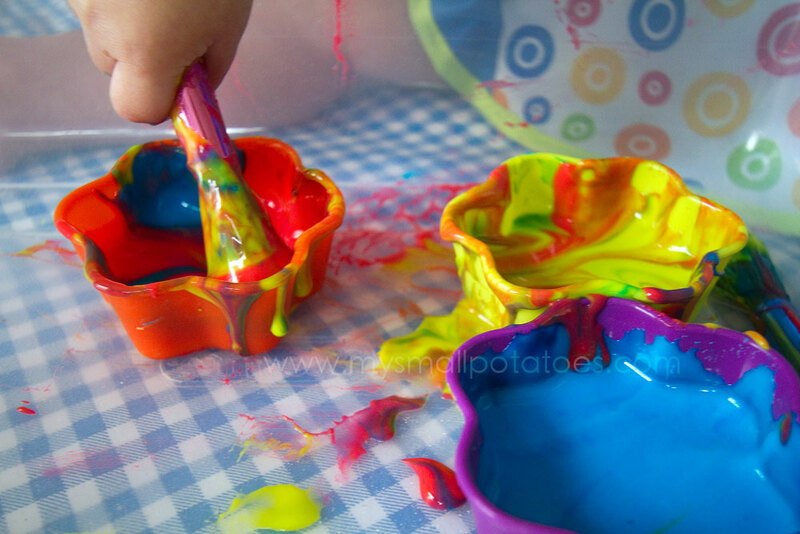 I have seen so many cool “bathtub” art activities for toddlers and babies and I’ve been inspired by them. My friend over a Growing a Jeweled Rose is especially good at creating bath time art. What a cool way to REALLY contain the mess! It all just washes down the drain! 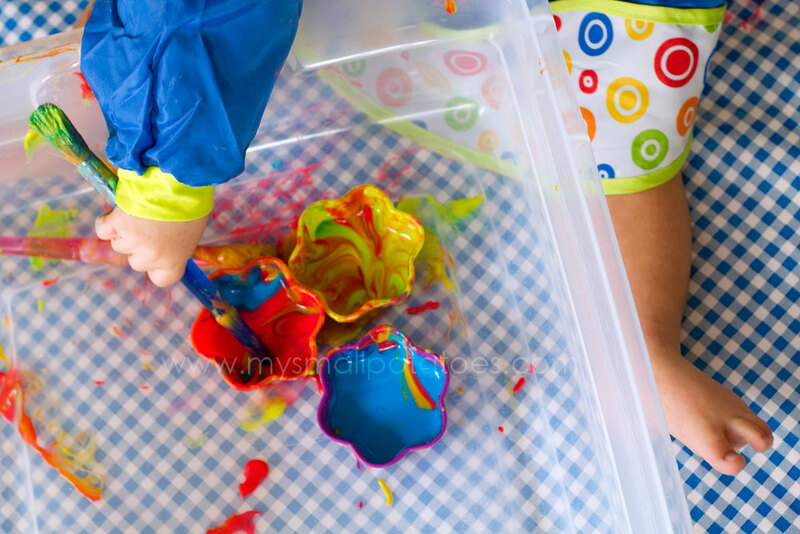 The bathtub is an excellent tool for parents to use for teaching art to their own children. I am running an approved dayhome business, and the use of the tub with other people’s children is not appropriate, so I had to come up with something else. 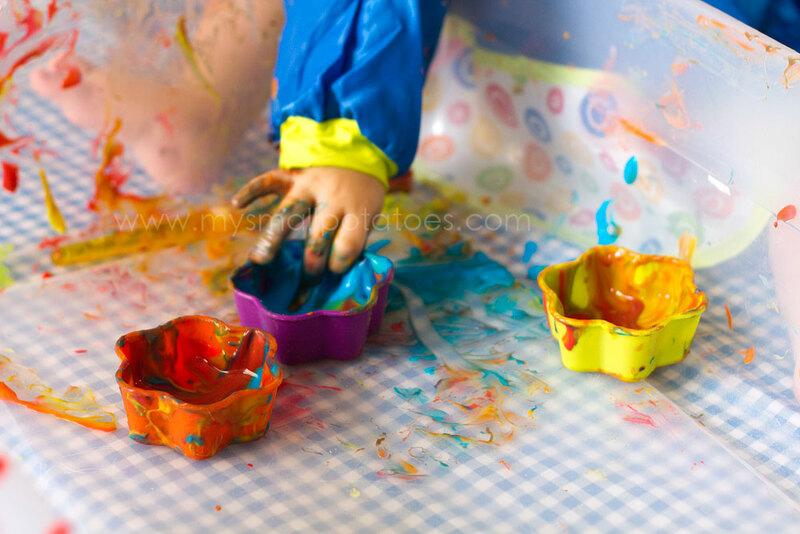 So I used a plastic tub, a splash mat, and a smock. 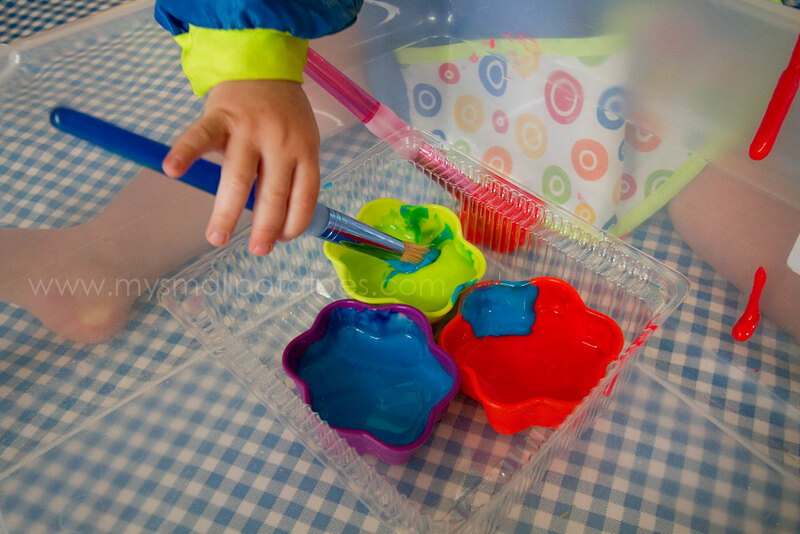 We have sensory bins for everything else under the sun, why not for paint, too? 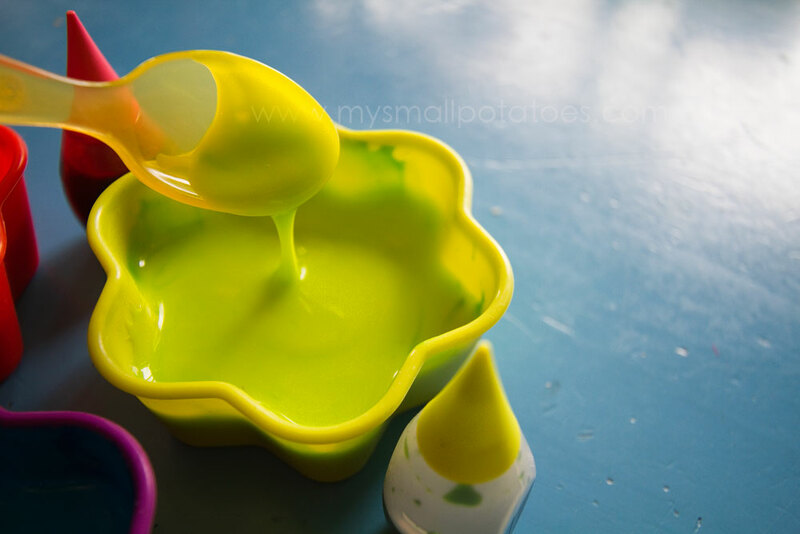 But because the paint was inside the plastic tub, the paint was not being shaken all over my kitchen floor! 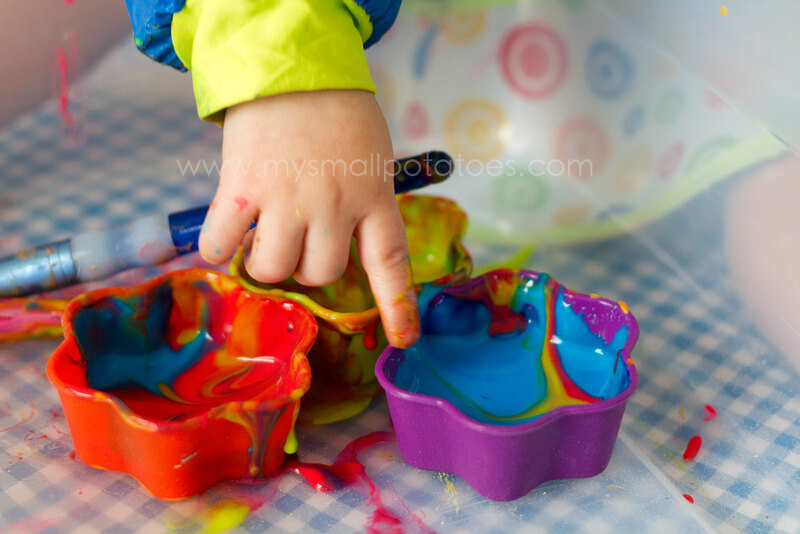 Baby J picked up the cups, dumped them out, swirled the paint around with the brushes and or his fingers. 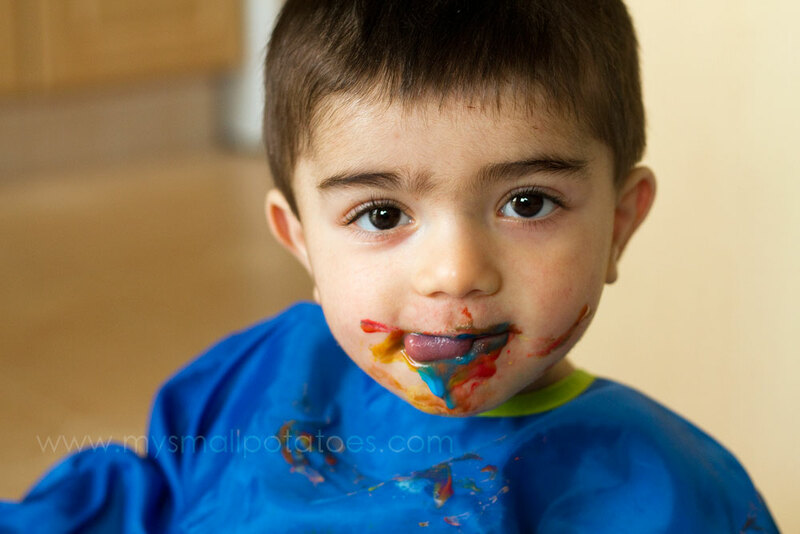 All the while, not being hindered by a grown-up trying to contain the mess. It was already contained inside the tub. Did he put the brushes in his mouth? 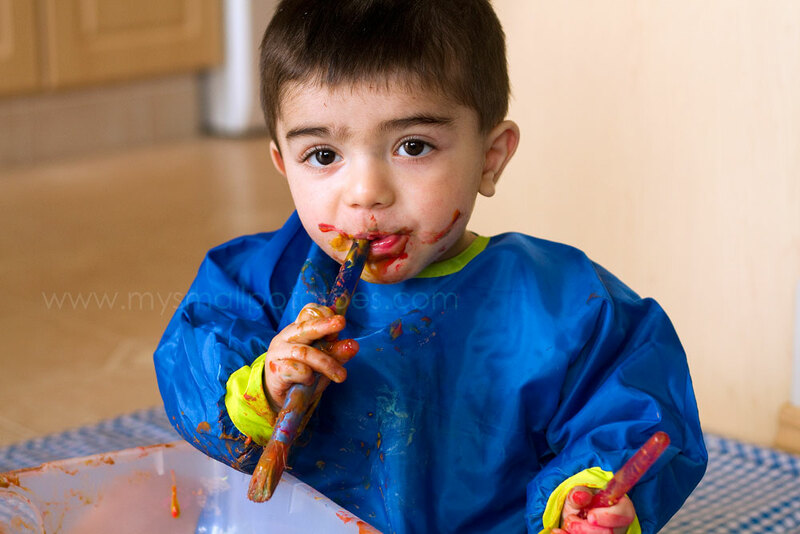 You bet he did… But because I left the soap out of the recipe (most finger paint recipes add dish soap for easy clean-up), he was perfectly safe, and perfectly happy. Remember, babies will not always keep their hands inside the bin. They don’t understand this rule. So there shouldn’t even be one. 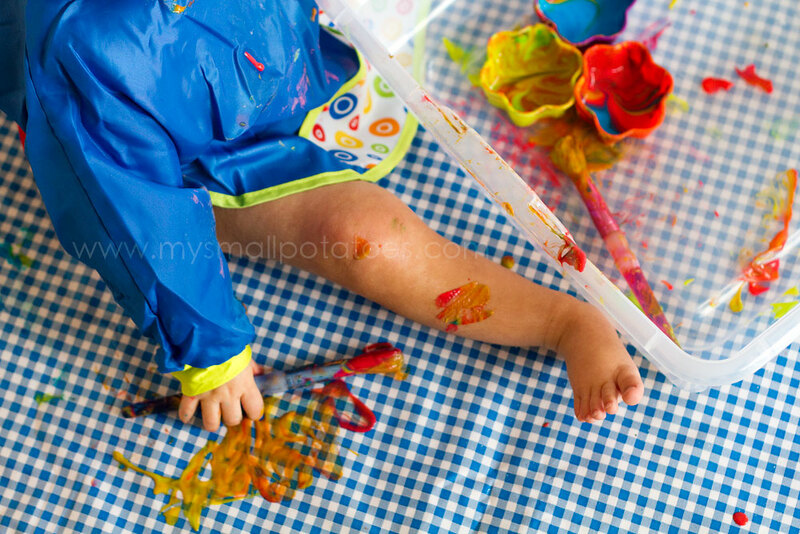 I use a splash mat under the babies so they can paint “outside the lines.” It’s also a good idea to have them in a diaper only so they aren’t painting on their trousers. 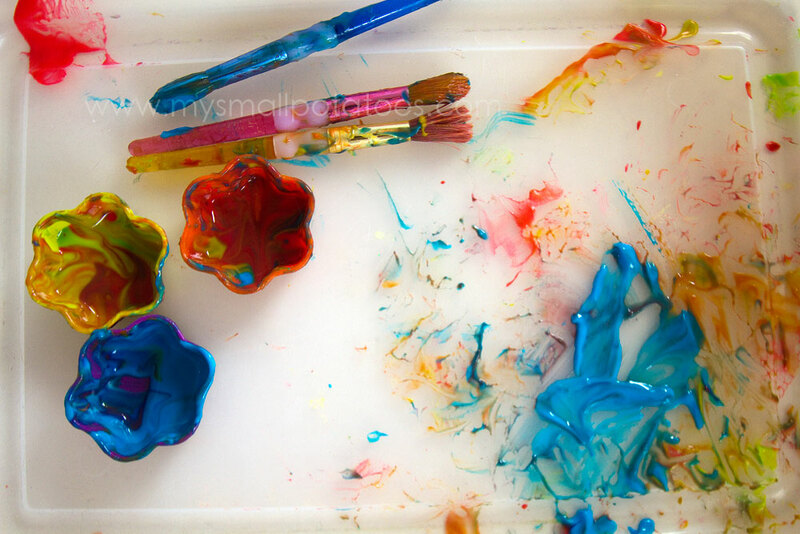 When baby is done painting, all the mess is inside one bin…easily rinsed in the sink or bathtub. Easily. 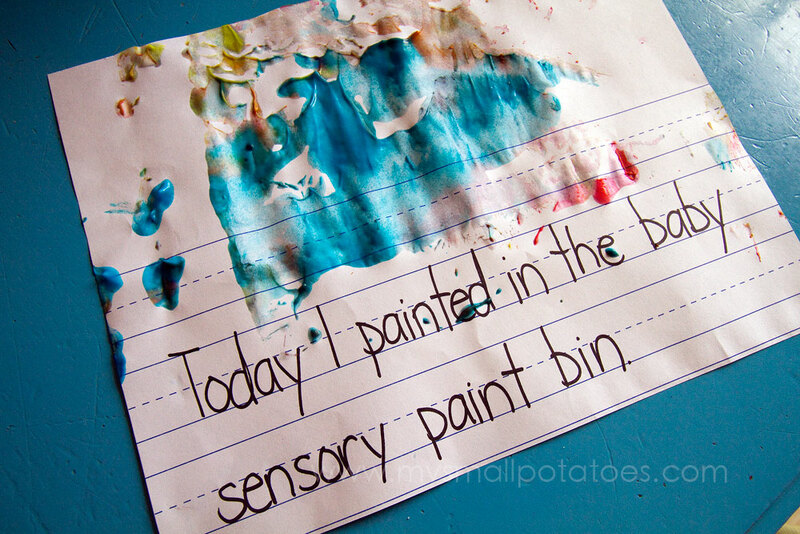 And because Mamas like to know what their babies have been up to during the day AND have keepsakes for journals or scrapbooks, I try to produce “evidence” of our activities when possible. It’s very simple to make a print of baby’s masterpiece… Thanks for stopping by! I will have to try this with my kiddos! Thanks for the great post! Very cool idea! We went to a Mommy&Me art night last week hosted by our school PTA. My 5 year old and 3 year old loved the painting activities. They were all very messy projects so I held my 1 year old the whole time….and he was fighting to get out of my arms to join them!! 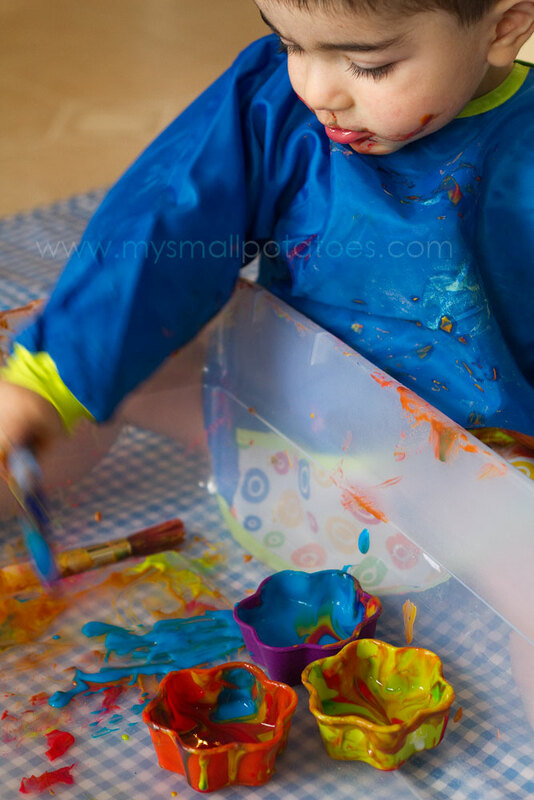 (for fear of eating real paint along with a clothing diaster) This seems like a safer method to let my little guy explore!! Thanks for sharing. Love this! I am definitely trying this out with the little guy! 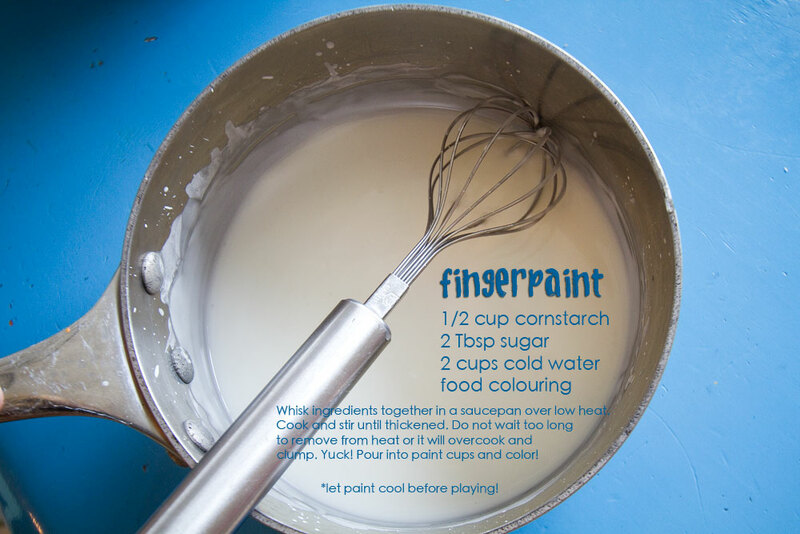 I am going to try this – it looks great! Can this be made without sugar?